Philip Morgan created an amazing resource for anyone who sells expensive services (like consultants) and needs a healthy stream of leads. Consultant website lead generation is about trust – and Philip’s techniques can help you build trust. 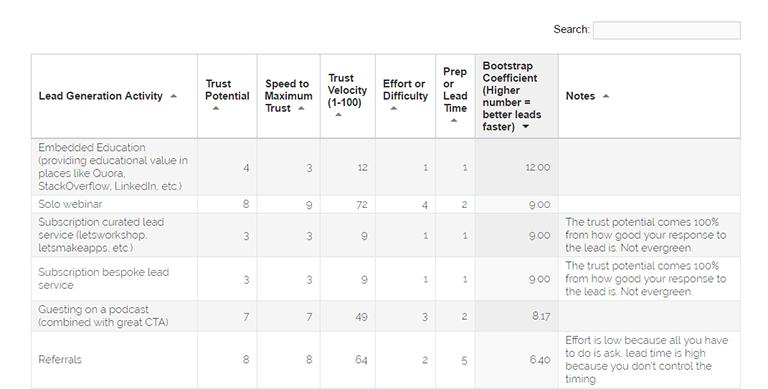 This resource is called Lead Generation Trust Velocity. It contains 46 lead generation strategies. You can sort each technique by how much trust it builds, how easy it is to implement, and more. If you are a consultant who struggles to come up with ideas for generating leads, use Philip’s list. It’s a fantastic cheat sheet for when you need ways to build trust, acquire leads, and get clients. This article goes through each technique and answers whether or not you need a website to perform it. 0 – No require. You don’t need a website to do this technique. There may or may not be benefits to having a website for this technique. 1 – Soft require. This technique is possible without a website, but much easier with one. There are also benefits to having a website for this technique. 2 – Hard Require. This technique is very difficult (if not impossible) without a website. Pay special attention to the techniques scored with 1. We know that we need a website for a contact form. We know we don’t need a website to do an outbound cold call. It’s the “1’s” that consultants often miss. “1’s” demonstrate the unique capability of your website to build trust with your audience at scale. I’ve sorted the list by “Bootstrap Coefficient.” The techniques closer to the top mean better leads, faster. You will also find a short tip on how to perform these techniques using your website. This isn’t meant to be an exhaustive guide. It will give you some ideas to get your creative juices flowing. NOTE: I acknowledge my bias here, so I tried to be conservative giving out 2’s. You can provide educational content on websites like Quora or LinkedIn without a website. In some ways, these websites provide a platform for those without the means to create a website to share their expertise and build a following. However – having your own website doubles the effectiveness of using Quora or LinkedIn for your marketing efforts. These platforms give you plenty of opportunities to plug your website. I frequently answer questions on Quora, and my website shows up in every answer I give. If your website is next to your name, it provides the perfect opportunity for them to learn more about you via your website. It’s much easier to have your own website to run a solo webinar. Depending on the technology you use, you can host webinars on your own website. Or you can use platforms like Demio or Zoom to host them. Either way, it’s much easier to get people to sign up for your webinar using your own website (or email list, which people join through your website). If you’re going to run a webinar, people are going to have to trust you with their time. Having a quality website gives you a vehicle on which you can build this trust. If you have a CTA at the end of your webinars that links through to a sales page, you would plug a link to your website there. Services like letsworkshop and letsmakeapps curate and send projects to you. You don’t need a website for this. You do need a portfolio in order to send out a good response to these leads. What better than your own website (that you control in both looks and functionality) to host your portfolio? It’s also a great credibility indicator to have your website in your response to these leads. You’re inviting the lead to check out what you have to offer with your website. It’s much easier to guest on a podcast with a website. In order to be invited to guest on a podcast in the first place, your going to have to build trust with the podcast host. By having your own website, you give them a resource to learn more about you. If you have spoken on podcasts or have been interviewed in the past, set up a page that hosts these. At the end of the podcast, you can send listeners to a page built for them on your website. Referrals have always been key for consultants to find more work. You don’t need a website to ask for referrals. However, your website and email list can be used to make asking for referrals much easier. I have my own referrals page set up to explain my referral process. You can use your email list to tell your audience you have spots open for work. After all – you’re using your email list to continually provide valuable content to your audience. They will return the favor by helping you. Short conversations at events with the right person can be great – but often end up leading nowhere after the event is over. Why not create a page on your website dedicated to saying “hello” to people you’ve met? This provides the perfect opportunity to start a relationship with every contact you meet. A relationship you start by giving value to them. This is a great way for you to follow up with people by inviting them to join up to your email list. Not everyone will. But many do, especially if you have a page set up for contacts you meet in person. Nurturing a lead is much easier when you have a website. Especially when your website is full of quality articles that help them with their challenges. When nurturing leads, you want to send them articles on your own website. You also want to send them articles from other websites that you think can help them. You can end up looking like a bit of a narcissist if you only send content from your own website. Your blog may be top-notch, but it probably doesn’t have all the answers. A JV is a joint venture webinar – a webinar hosted by two business owners. Similar to running a solo webinar, having a website helps with getting people to sign-up for your webinar. It also helps with your CTA at the end of the webinar. You don’t need a website to get a minor mention in the press. Your own website does help you get discovered. It also gives your mention the opportunity for links. When people want to check out more about you in this mention, your website gives them this opportunity. You control what they learn about you on your website. You get to choose what they see, and the design of your website can encourage them to take action. When you get mentioned in the press, your website helps you start a relationship with each reader. 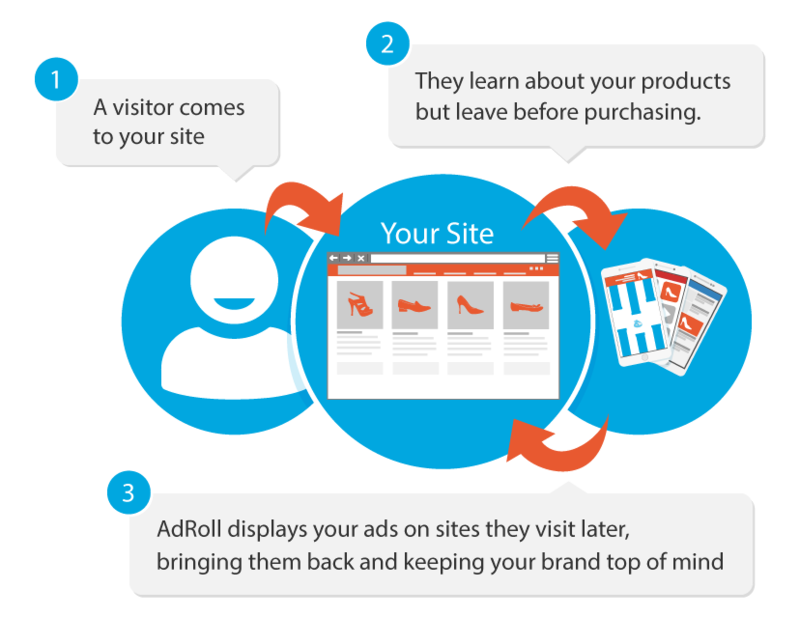 When someone visits your website and then leaves, retargeted ads display your ads on subsequent websites that they visit. It keeps your offer in front of visitors, and your brand on the top of their mind. It’s a clever way of online marketing, and it’s also very effective. There is no need to have your own website to join social media and set up twitter cards for lead generation. But having your own website is a great addition to any social media profiles that you have. Having your website right in front of them on your profile gives them the chance to learn more about you. Job aids, calculators, and other helpful pieces of content are best suited for your website. You can host them elsewhere, but why would you? Having them on your own website will bring you more visitors and position you as someone helping your readers. Job aids, calculators and any type of helpful, interactive content is a great fit for your website. A major mention in mainstream press requires a lot of credibility. Credible consultants have professional websites. These have the potential to send thousands of visitors to your website. There is no need to have a website to give small consultations. Your website can help you secure and book consultations through your website. 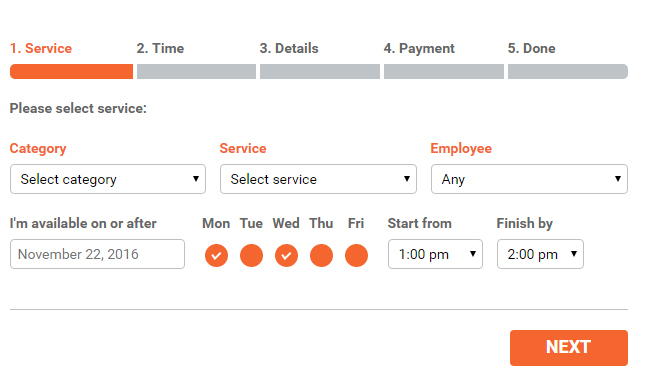 You can use something simple like WP Simple Booking Calender, or something more advanced like Bookly. Having a website may not be necessary for this technique – but it can surely make your life easier. Lead magnets are an essential part of any consultant’s website. You can’t build up an email list unless you give readers a reason to join your list. Take one problem that’s common amongst your target audience, create a piece of content that helps solve that problem, and then offer it for free in exchange for their email address. A lead magnet can be many things. A short ebook, a series of articles, an email course, a whitepaper, a template, etc. Anything valuable that encourages your visitors to give them your email address. Starting out your relationship with each reader by giving them a quality piece of content is powerful. It will help set the frame of your relationship with each subscriber as the trusted advisor. A content upgrade is when you identify a high traffic blog post on your website and create a specific lead magnet related to this post. You’ll need a website for this to integrate your lead capture onto the post. Content upgrades are amazing for boosting conversions. Once your blog is up and running and you have some posts generating a lot of traffic, use content upgrades to grow your email list at a faster rate. No website is needed to make a cold call. I’m against cold-calling when it comes to consulting, especially just for selling. This is a relationship business – so instead, I would reach out (via phone, email, whatever) and provide value. If you’re going to cold-call, do it to start relationships, not sell expensive services to someone who doesn’t know you. Introduce yourself and strike up a conversation. Get to know people in your industry. Ask them about their business challenges. Send them a great piece of content you have on your website, or to your resources page. Doing this type of outreach with your own website is a great strategy. You can also use lead magnets on trusted third party websites. This technique involves creating a lead magnet on a website who’s audience is related to yours. This is a fantastic technique for any consultant looking to drive traffic to their website or grow their list. You can “borrow” someone’s audience by providing them with value through this lead magnet. As long as it is a win for you, the 3rd party website, and their audience, this can be a powerful lead-generation technique. An online business group can be a great way to network, mastermind, and for accountability. You don’t need a website to do this. You can use something like LinkedIn to host your group. You can use your website to host this, especially if you are offering services or consulting to people within this group. Creating a membership website is ideal for this technique. You can have members pay to sign up for private access to pages of your website for the business group. If you are a consultant looking to host an online business group, a dedicated website for this group is a good way to cut out the noise common to social media platforms like LinkedIn. You don’t need a website to host an in-person education event. A website can help with advertising the event and capturing attendee information. You can also follow up with attendees by giving them an opportunity to join your email list or purchase a product/service you offer. As always – a website helps with credibility. An event looks more legitimate if there is a website to back it up. I’m giving this a 2 because hosting a podcast on your website is a great idea for your listeners. Technically it is possible to host a podcast without a website – but it’s much more difficult to set up. Hosting your podcast on your website is a great way to have podcast episodes, show notes, comments, all in one place. It also helps with getting your podcast discovered. If it’s just on iTunes or Spotify, it’s much harder for people to find. Having your podcast set up like this is incredibly helpful for your listeners – and makes a great addition to your website. Podcasting is an excellent marketing strategy that helps establish you as an authority in your industry. A resource center/content hub is one of the most important pages of your consulting website. It deserves a spot in your primary navigation. As a consultant, your resources page gives you a way to show your expertise by curating valuable resources that help your audience. You can organize these in a logical way that gives your reader a ton of information on the topic they are seeking help with. Include some of your own resources, and use these as lead magnets to get more readers onto your email list. To guest post on a major publication, you will need credibility. Websites are a fantastic credibility tool that will help you make the connections to guest post on a big-time publication. You can see a lot of traffic from one of these guest posts if you include a link to your website at the bottom of the post. To guest post on a minor publication, you won’t need as much credibility as the technique above. I’d go so far as to say you won’t need a website to do this. But it would be helpful. Sponsoring a newsletter can be a great way to reach a new audience. If you’re at the level where you can sponsor a newsletter, you’ll need to have a website. If the audience of the newsletter you’re sponsoring wants to see what’s behind your logo, your website gives them the opportunity. To be listed in a reputable directory, you need to run a reputable business. A well-designed website is a good sign that you run such a business. If you put your feet in the shoes of a directory like Clutch or G2Crowd, you want to know about the businesses in your directory. Having a website that communicates who you are and what you do helps these directories trust your business and list you on their website. I’m sure people have given talks at national or international conferences without a website. However, it would be easier to secure these talks with a website. Why? A well-designed website gives you credibility and allows conference organizers to see your past talks. You can also use it to start a relationship with people who loved your talk by sending them to your website and providing valuable content for them. No website required here. I’d imagine sticking your website somewhere on the content of your envelope might help – but it’s optional. You don’t need a website to do active social networking. But it does turn your active social networking into a marketing channel. Actively doing social media without having a website for those interested in what you’re saying means your missing out on traffic. Educational videos are an excellent marketing idea. Not only will it help people find you, but it will position you as the expert on the topic of your video. You can do this without a website using YouTube or a similar video hosting platform. Or – you can host them on your website and have a page dedicated to your educational videos. This is a nice touch and a great addition to any consultant’s website (which you control). Ads are much more effective when they are highly targeted. When someone clicks on your ad, in most cases, they will be taken to a page on your website that you’ve set up for this purpose. Some platforms you can link to other pages than your own website, and some you cannot. In general, having your own website for running ads is ideal, as you control what’s on the page and can track it more effectively. Tests, quizzes, or surveys are excellent ways to capture email addresses or information from your audience that helps your business. There are thousands of solutions you can use to build these, but putting them on your website is a great idea. Tests or quizzes, especially for consultants, can be powerful ways to show your expertise and to qualify potential leads. You can also use them for lead generation. A contact page is a requirement on every consultant’s website. It can be as simple as name, email and message – or you can use multiple contact forms to generate leads. Either way, it should be easy for visitors to contact you via your website. You should encourage it. You can have a contact form on your website that sends messages straight to your preferred email. This gives members of your audience an easy way to start up a conversation with you. Contests are a great marketing tool for your business. Often, contests involve randomly selecting from the pool of entrees (who sign up to your email list). The more entrees share a link to your content page, the higher chance they have to win the contest. Having your own website makes it easier to run contests. There is software for your website that makes this easier. You can also use third party solutions, but having your own website certainly makes this easier. Getting a major media interview would be much easier with a website. Businesses that are serious about their brand have a website, and the press knows this. This gives you the perfect opportunity to plug your website. From your website, listeners can join your audience. It will be easier to be invited to do a secondary talk at a big conference if you have a website. As I’ve said many times before: your website gives you credibility and showcases your brand. If you’ve given talks before, you can have a page on your website that shows them. No need for a website to attend one of these. If you are in the position where you’re giving an invitation-only executive briefing, you already have a website. An email course is one of the best possible lead magnets to include on your website. You could do this without your website, but using your email course as a lead magnet on your website is a great idea. I’m giving this a 1 because your website is the easiest way to get users to sign-up to your email list. Few, large but regular emails to your list is a great way to provide value to your audience. Many frequent small emails to your list provide value and keep your brand at the top of your reader’s mind. Consultants should all be blogging, and blogging is best done on your own website. My post on blogging for consultants will tell you why you should blog and how to do it consistently. It’s one thing to declare yourself an expert on something – it’s another to have a blog full of quality articles that demonstrate your expertise. A search-intent add (or PPC) is an ad on Google. You pay for every time someone clicks on your ad (that goes through to landing page on your website). On most platforms, like Google Adwords, you’ll need to direct links to your own website. You don’t need a website to attend a trade show (as far as I know), but having a website provides a great opportunity to demonstrate credibility. You can also have it up at your booth and on your business card. This helps people find out more about you. I’ve had clients approach me to have their website done specifically for an upcoming trade show. If they didn’t have a website up, visitors wouldn’t take them seriously. No need for a website to do this – but having a website helps with both credibility and resources that help with people you are reaching out to. Also – if you have a dedicated sales page that you are sending, it’s best to have this on your own website. When someone clicks on your ad, you need to send them somewhere. This could be your website, a certain page of your website, or a specific landing page for a particular product or service. Philip Morgan has done every independent consultant a favor by creating this list. If you are a consultant looking to create more trust and find more leads, Lead Generation Trust Velocity will give you plenty of ideas. I hope this article has helped you understand how you can use your website to make performing these tasks easier and more beneficial. Having a website is much more than just an online brochure or business card. You can (and should) use it as a trust vehicle. Building more trust will bring you more leads. And more (better) leads means more clients. The web is a fascinating piece of technology that is growing and expanding every day. Your own website has an incredible amount of potential in helping solve your biggest business problems as a consultant.